1.BFT-1300E is a wide format laminator,can process items that are up to 51inches width. 3.This laminator has several different speed settings so you can choose the right one for your particular project. 4.the diameter of roller is 105mm(4.13") ,adjust the right amount of pressure so you can get crystal clear results. 5.with foot pedal,This makes things a lot easier because your hands will be free to handle your documents. Also, this device is safe to use because it's equipped with a photo-electric safety stop. 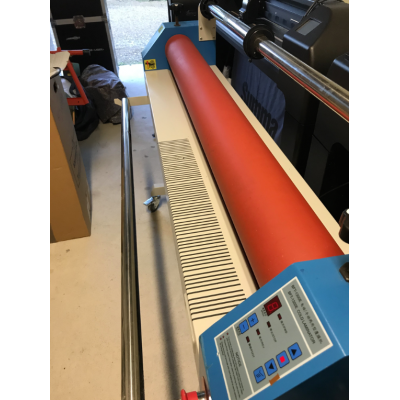 6.it is cold laminator without heating.this will be a problem if you want to use thermal film.